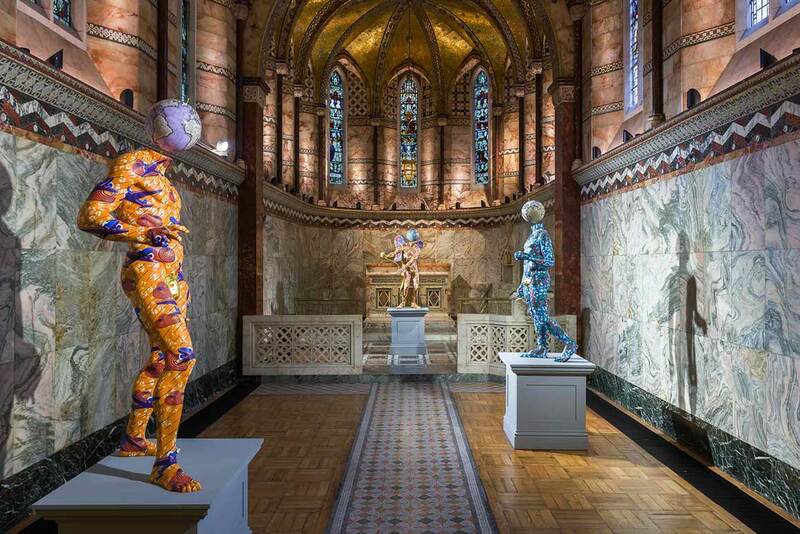 We welcome art galleries based in London and throughout the world to exhibit at the Fitzrovia Chapel. Over the last year, we have hosted exhibitions by galleries and cultural organisations including the Stephen Friedman Gallery, Richard Ingleby Gallery, the Horiuchi Foundation, Erskine, Hall & Coe, the installation artist Scanner and TJ Boulting Gallery. The chapel has taken part in Photo London fair and Frieze Art Fair. We are experienced at showing and promoting high-quality exhibitions in our beautiful space. An architectural, historical and design masterpiece in its own right, the chapel provides an inspiring backdrop — and sufficient empty space — to show artistic pieces in the most stunning way. Your exhibition will gain publicity not just by its own merit but by its association with the chapel which often becomes a talking point in reviews and articles. Stephen Friedman Gallery presented hand-painted sculptures by artist Yinka Shonibare MBE during Frieze London in October 2018. We were delighted to welcome Richard Ingleby Gallery in residence during Frieze London in October 2017. Artists David Batchelor, Jonathan Owen, Kevin Harman and Peter Liversdge were presented during the show. In May 2017, the Horiuchi Foundation presented a series of photographs at the chapel by Tomohiro Muda. The exhibition was called Icons of Time: Memories of the Tsunami that Struck Japan and was a photographic record of artefacts left behind in the wake of the disaster in 2011. 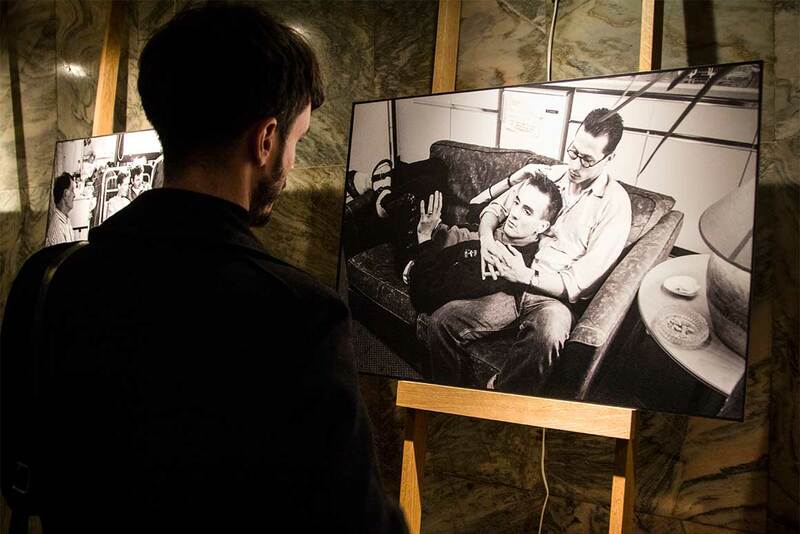 It formed a satellite event for Photo London fair. 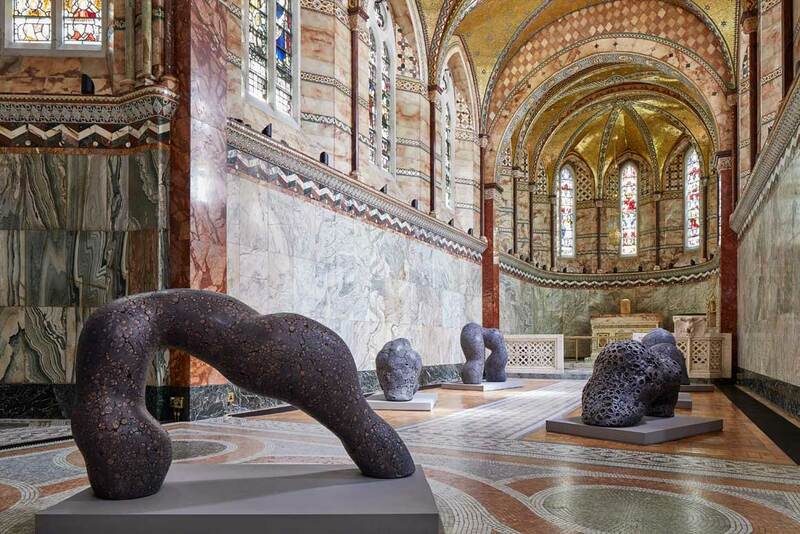 This major London ceramics and sculpture gallery hired the chapel in July 2017 to present Claudi Casanovas’s third solo exhibition with Erskine, Hall & Coe. Quart Minvant explored the concept of emptiness with six massive stone sculptures in the jewel-like interior of the chapel. If you are an art gallery, an arts-focused organisation or an artist or photographer who would like to discuss venue hire for your exhibition or show, please contact Vaida Pikzirne, our Event and Operations Manager, by email at vaida.pikzirne@fitzroviachapel.org or phone +44 (0)20 3409 9895. If you’re looking for a unique venue hire in London for fashion week — or a special shoot any time in the season — give us a call. We are centrally located and easy for your guests to travel to. Yet we are also a ‘hidden gem’ with a unique vibe which will thrill and amaze. The main body of the chapel actually has a natural — and stunning — runway. There is also room for up to 75 chairs on either side. If you are holding a presentation rather than a catwalk show, there is space to display your pieces and for visitors to view them with ease. The ethereal and ornate backdrop of the chapel will provide an extra wow factor for buyers, journalists and creatives at your shows. 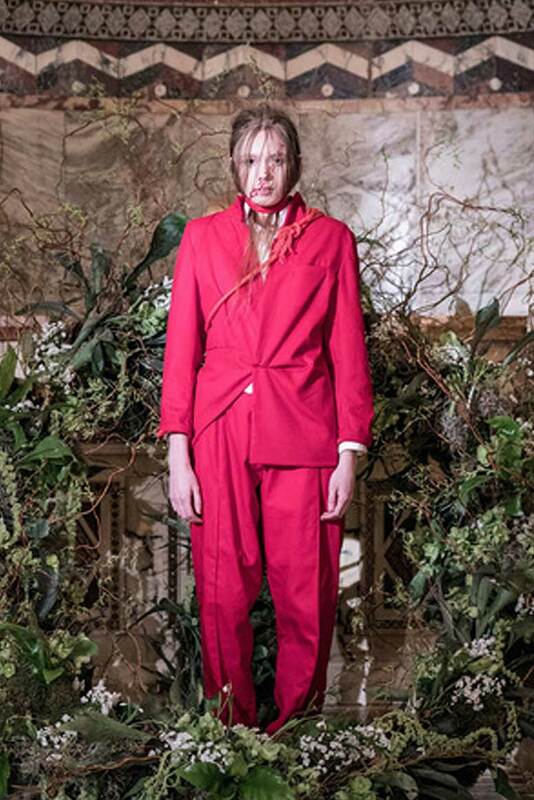 The chapel hosted the Phoebe English show as part of London Fashion Week. It was featured in Vogue and Elle, among many other publications. We were delighted to host the spring and summer 2018 show for London designer Alistair James during London Fashion Week. The show was featured in Vogue. Luxury womenswear retailer Avenue 32 hired the chapel to promote a range of crushed velvet and high-end designer clothes. Sharon Wauchob is a designer who focuses on bringing the unexpected to the area of contemporary luxury clothes. 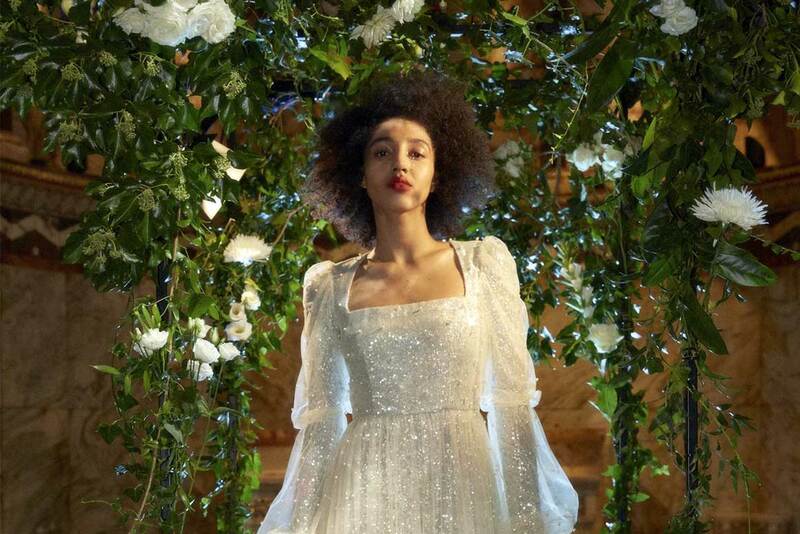 For her collection shown at the chapel early in 2018, as part of London Fashion Week, she demonstrated her trademark use of fabrics, folds and elegant details. 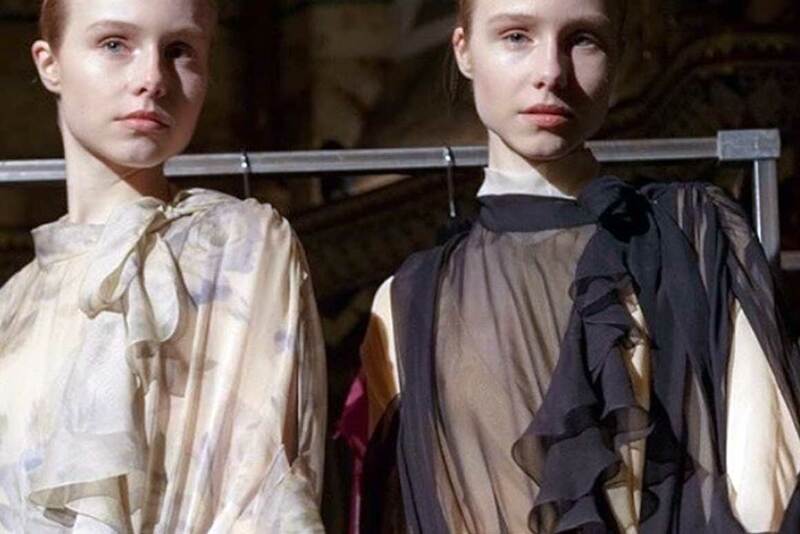 If you are a designer label or promoter looking for a unique space to promote your collection, please contact Vaida Pikzirne, our Event and Operations Manager, by email at vaida.pikzirne@fitzroviachapel.org or phone +44 (0)20 3409 9895. If you’re searching for a stunning location for your drinks party (or even after-party), birthday celebration, private dining or Christmas occasion, the chapel will provide the ultimate in alternative, exquisite locations. 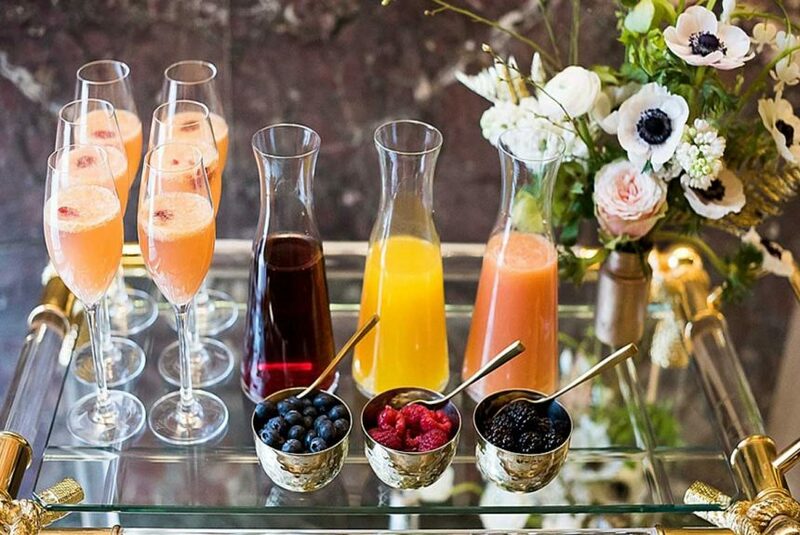 We host private dining experiences and cocktail parties, award ceremonies and prize-giving. Increasingly, our visitors are looking for a beautiful, immersive experience to accompany their event or special occasion. A venue with an imaginative and dream-like interior that matches their ambitious event ideas. 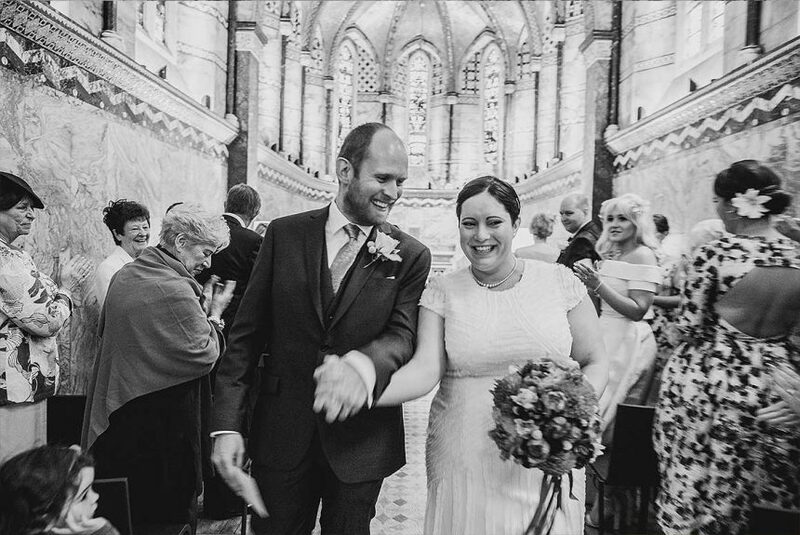 That is why the exquisite surroundings of the chapel are so popular as a gorgeous backdrop. Our clients have included Artangel, the Arts Council, the Fitzrovia Partnership and Young People in the Arts. Please talk to us about your party or celebration ideas. Need help organising your special event? 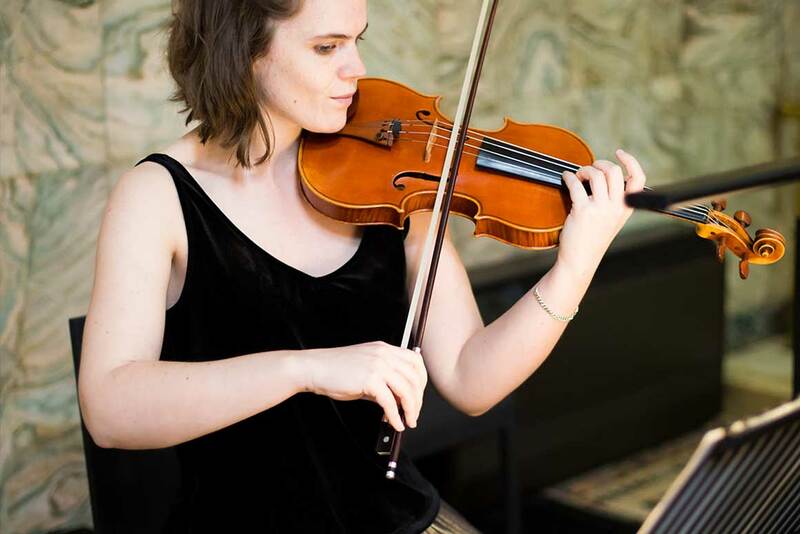 If you’d like to discuss how we can help create your perfect event in the ‘stunningly beautiful’ and ‘glorious’ historical space, please contact Vaida, our Event and Operations Manager, by email at vaida.pikzirne@fitzroviachapel.org or phone +44 (0)20 3409 9895. 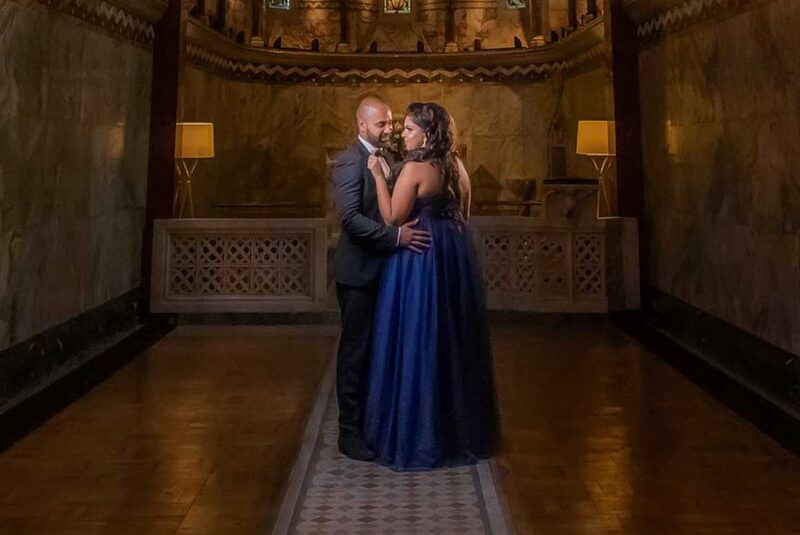 If you’re looking for a unique location to make that first step in the journey of marriage, the Fitzrovia Chapel may well be your perfect venue. 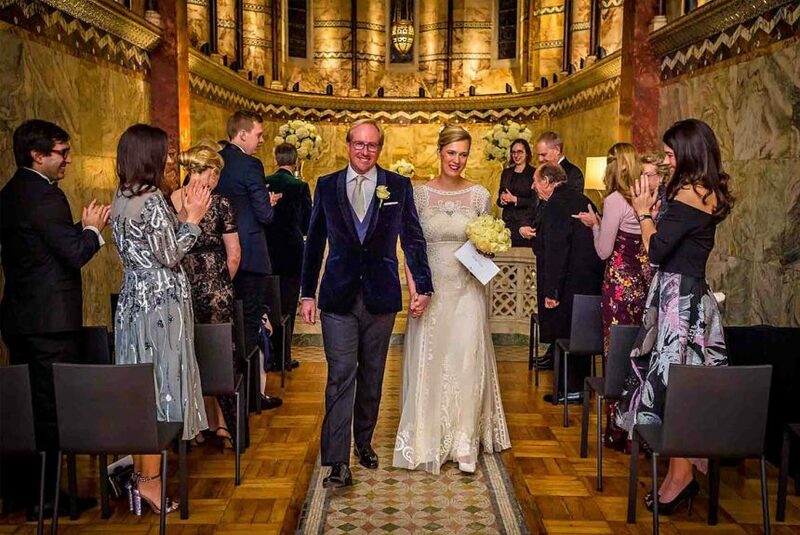 With our intimate atmosphere, breathtaking interior and sense of history, the chapel has become one of the best places to propose in London. We work with the capital’s most experienced proposal planners to bring you an occasion that neither of you will forget. The chapel is often called a ‘hidden treasure and it’s a wonderful secret spot to plan your wedding proposal. It’s your special occasion and can be as individual as you’d like it to be. Your input is hugely important. 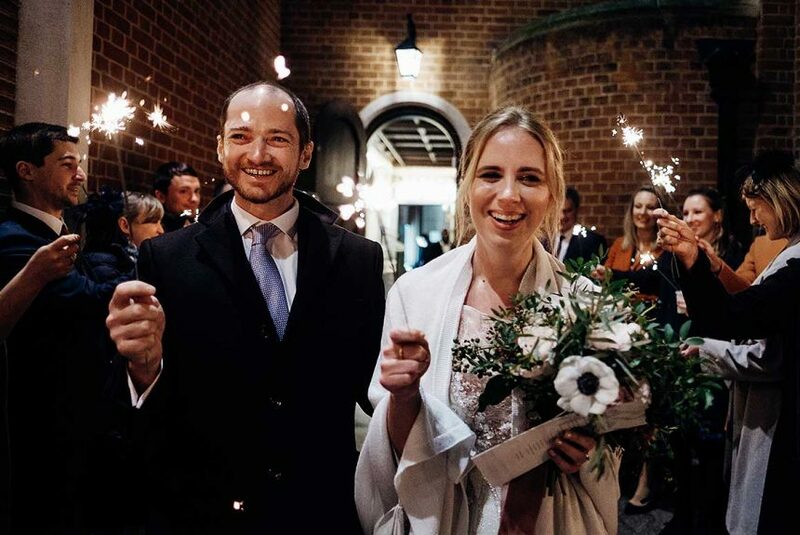 However, you might like to consider including elements including a field of rose petals leading to the altar, fairy lights, photo books telling the story of your relationship, musicians such as a harpist or violin player, beautiful flowers, candles or a professional photographer and videographer to create lasting mementos of your day. Engagement photos or an engagement film will become some of your most treasured items. You may want to invite friends or family to be present to help celebrate your engagement or perhaps this is an event purely for the two of you. Whatever you choose, the chapel will become the backdrop to an unforgettable occasion you will remember for the rest of your lives. 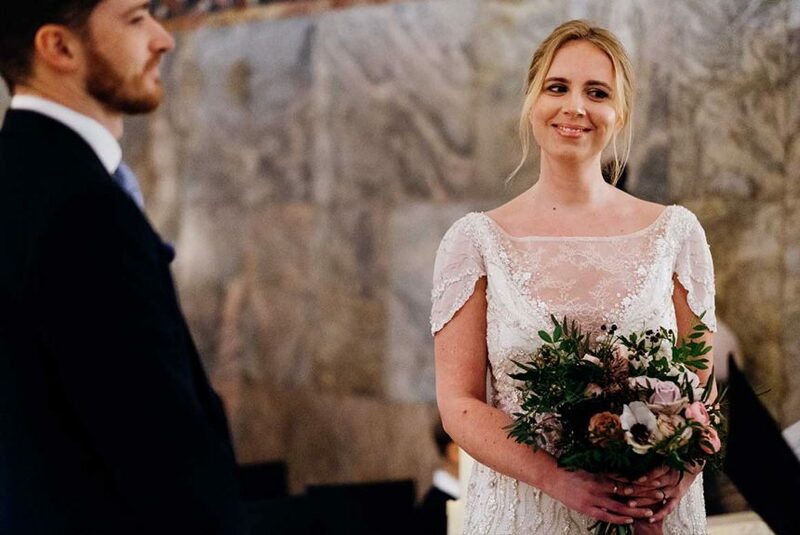 If you’d like to discuss how we can help create a perfect proposal in the ‘stunningly beautiful’ and ‘glorious’ historical space, please contact Vaida our Event and Operations Manager, by email at vaida.pikzirne@fitzroviachapel.org or phone +44 (0)20 3409 9895. Please contact the chapel team for more details and to find out abut more wedding proposal ideas that work. And if you’re a wedding proposal arranger who would like to talk to us about using the chapel as a venue, please get in touch. 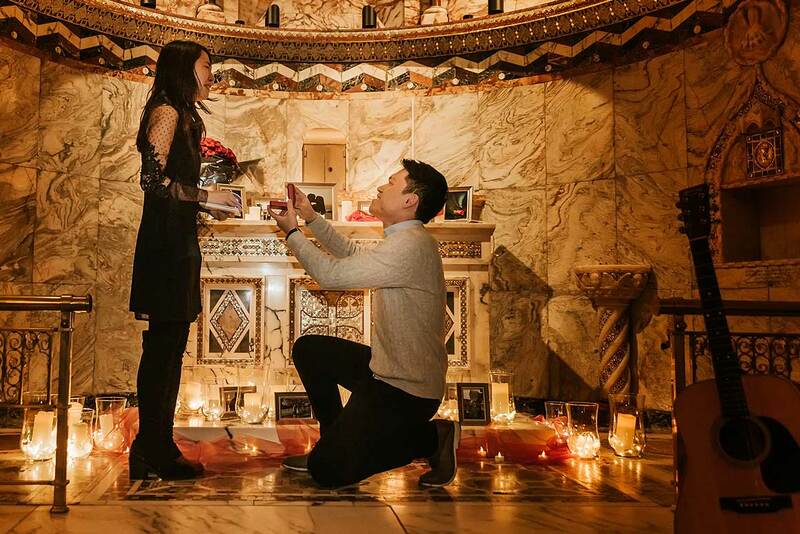 We work with professional wedding proposal companies including The Proposers and The One Romance. And after the proposal, we hope you will complete the circle by choosing the chapel as the location for your ceremony. With our vaulted ceilings, mosaics and exquisite architecture, we are one of the most amazing wedding venues in London. 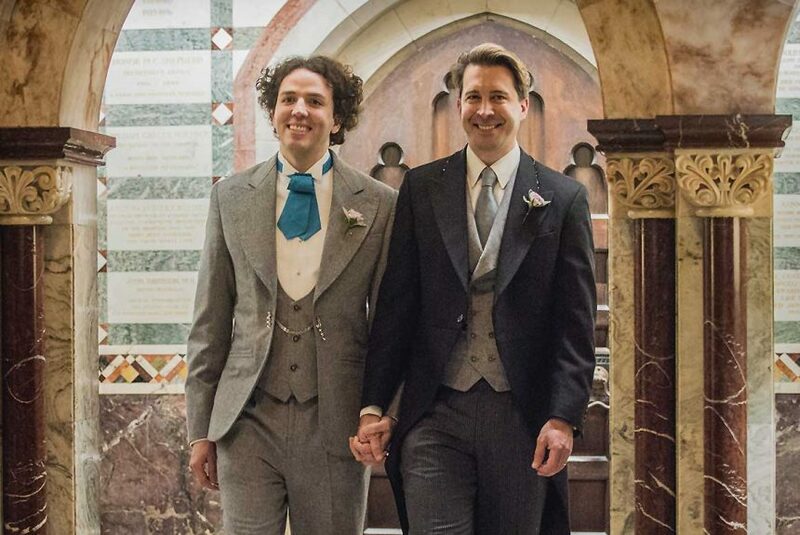 There can be few more amazing venues to hold your non-religious wedding or civil partnership than the Fitzrovia Chapel. Centrally located, yet intimate and unique in flavour, the Grade II*-listed chapel exudes grace, beauty, history and Gothic charm. When you take a look through the images throughout this website, you’ll discover that the chapel is truly the kind of place where memories are made. 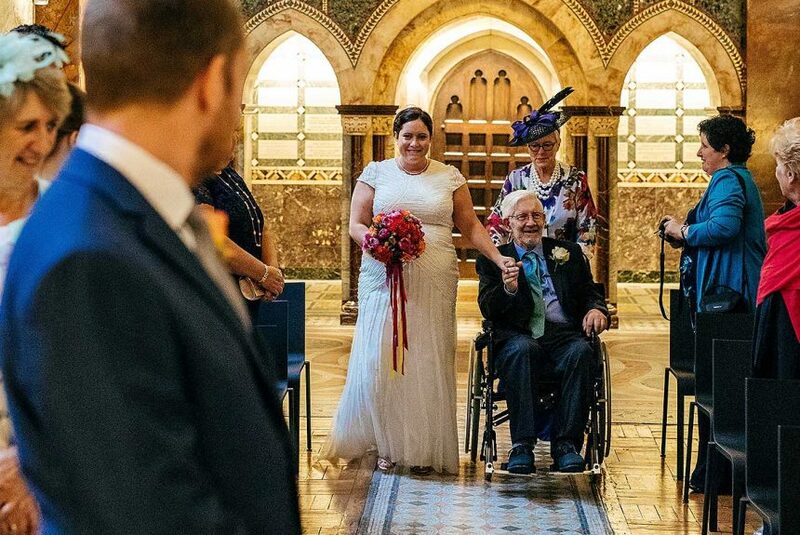 Take a look at the wedding photos on this page and you’ll see that the chapel is a different kind of place to get married. Many of our couples have been searching for a venue that’s like no other. We offer a building so steeped in beautiful design and history that you almost don’t need to dress it up fo the day — but of course you can. There’s a certain style and exclusivity that comes with the chapel and, blended with your own ideas and wishes, this makes it a fabulous location for your special day. A legal or non-legal ceremony? We are a registered venue for wedding ceremonies. 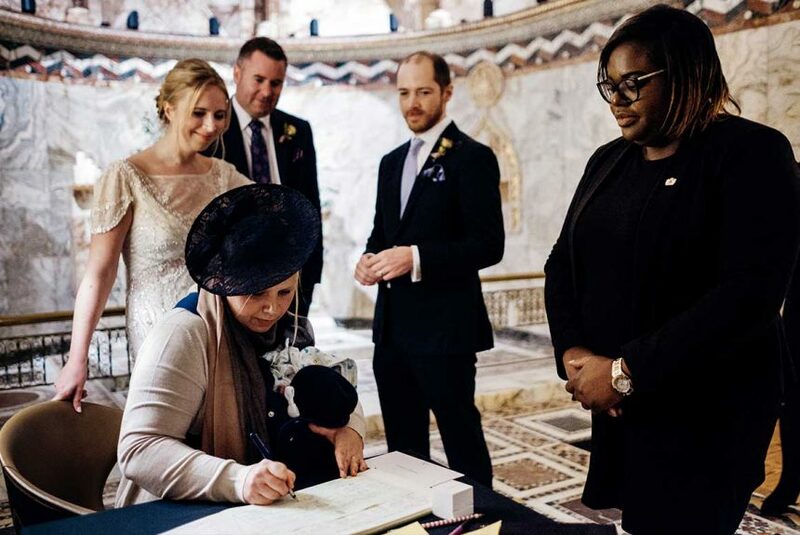 This means that you can be legally married if your ceremony is officiated by a registrar from the borough of Westminster. However, you may wish to do something slightly different, outside of the legal (and religious) restrictions. You may like to make your vows in the presence of a humanist minister or a celebrant, for example. This can be a truly beautiful occasion. 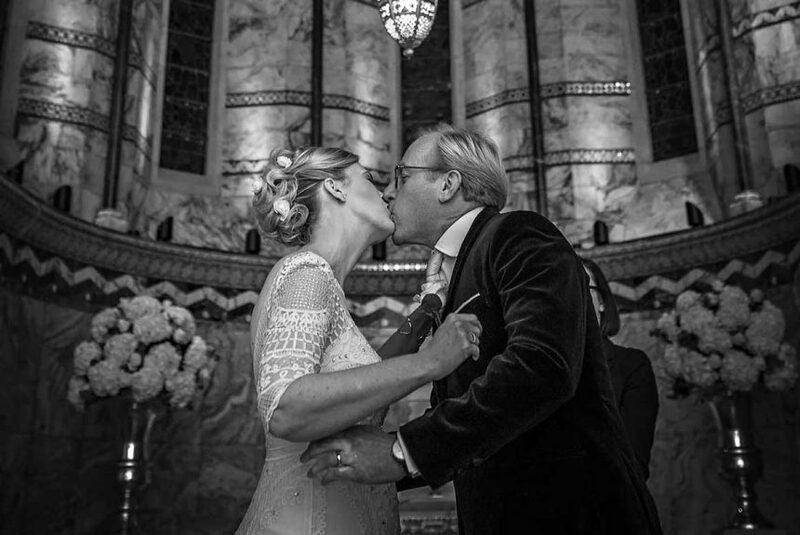 Some couples take care of the legal part at Westminster Registry Office but have a day to remember at the chapel as well. You can choose to have an intimate ceremony or a larger wedding with drinks afterwards. We would be delighted to work with you to create a bespoke wedding ceremony at our unique location. 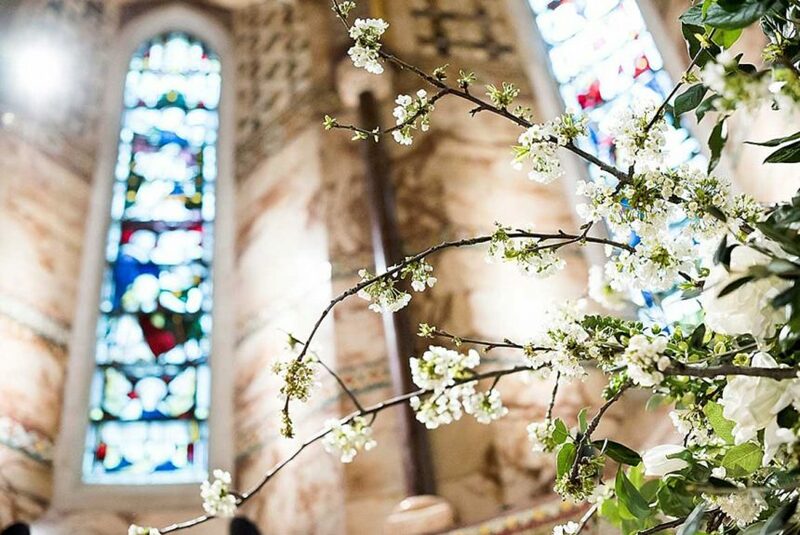 If you’d like to discuss how we can help create your perfect day in the ‘stunningly beautiful’ and ‘glorious’ historical space, please contact Vaida our Event and Operations Manager, by email at vaida.pikzirne@fitzroviachapel.org or phone +44 (0)20 3409 9895. Will the ceremony be legal? What does a secular wedding mean? What does the venue hire fee includes? Do you have any suggestions regarding live music, caterers, decorations or flowers? Does the organ work? Can we have an organist for our wedding? How much time do we need for a wedding ceremony? What are the restrictions regarding decorations? From classical music festivals and choral events to recording and filming, the chapel has become a desirable venue for all types of music professionals. 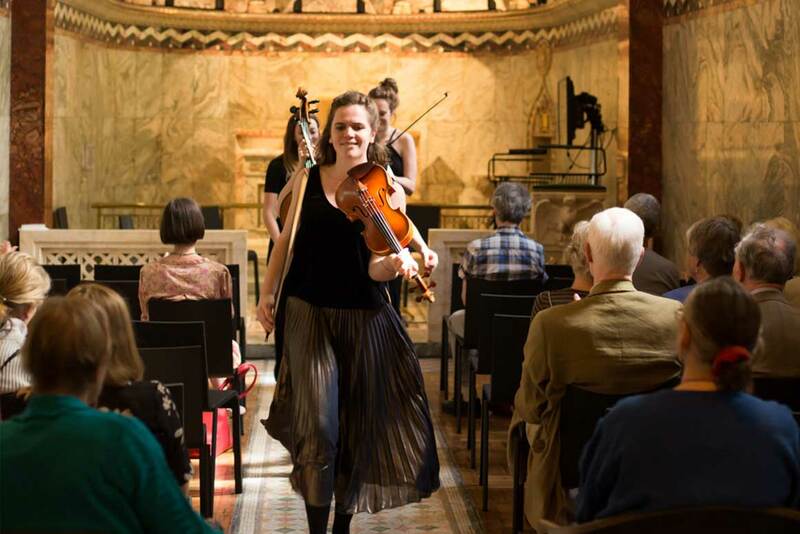 If you’re searching for a standout background to your music video, a breathtaking location for your concert or an inspiring central London venue for a rehearsal, the Fitzrovia Chapel may be your place. There can be few spaces in central London that combine the intimate atmosphere you need for a shoot or small concert with the intricacy of design and stunning features you require for an incredible backdrop. The chapel is the venue for part of the annual Fitzfest music festival and the London Handel Festival. We have welcomed Katie Melua to the chapel as well as the Genesis Sixteen choir, Allman Brown and the Vickers Bovey Guitar Duo. Do talk to us about hiring the chapel as a music venue. 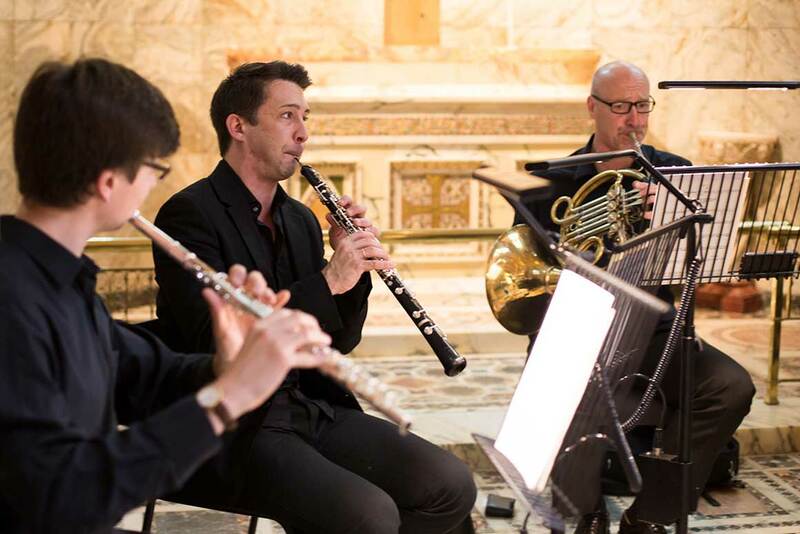 Fitzrovia has a rich tradition of music and we love to continue this by turning the chapel into a place for all kinds of sounds. Email us at vaida.pikzirne@fitzroviachapel.org or phone +44 (0)20 3409 9895. Nestled in the heart of an area like Fitzrovia, it’s hardly surprising that literature is an important part of our culture. Through our monthly experimental Wireless Contemplation events we have focused on writers such as Virginia Woolf, George Orwell and Doris Lessing who have a strong affiliation with the area. More contemporary writers such as Jack Monroe and Toby Litt have chosen the chapel to launch new books. If you’re looking for an event venue in London as part of your product launch plan, the chapel may be the perfect location. We can provide a unique cultural and historical backdrop for your launch event. Often described as a ‘hidden gem’, the chapel doors open up to an architectural and design masterpiece. 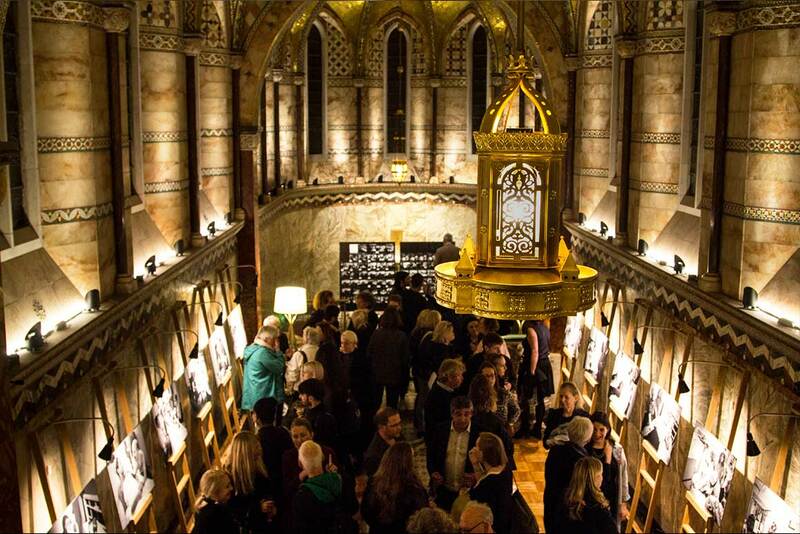 For your London launch at the chapel, your photos will be stunning and your buyers will be impressed. Please discuss your launch event ideas with us and we will be happy to help. Need a place for a launch? Do talk to us about hiring the chapel as a venue for your launch. Email us at info@fitzroviachapel.org or phone +44 (0)20 3409 9895. You may have spotted the chapel in the BBC’s Apple Tree Yard. Singer Nathan Ball also recorded the film for his track Right Place here. Singer Allman Brown also filmed songs from his latest album at the chapel. As a filming location, we are centrally located and provide a unique, readymade backdrop. As a secular building, you have none of the restrictions of a consecrated church but do have the fabulous interior and architecture of the most wonderful religious space. Plus, you’ll have the reassurance of knowing that although the chapel is an incredibly special place, we haven’t had hundreds of films shot within our walls. Of course that means your advertisement, film or TV show will have the surprise factor. With our inspirational architecture and interior design, the chapel is a great location to discuss, to plan, to think, to build teams — or simply to break away from the regular office environment. If you need to hire a meeting room that is centrally located yet will be a revelation, you may have found the perfect place. The design of the chapel naturally accommodates a board table. Alternatively chairs can be placed in a circle or all facing forward. This is also perfect for training, network meet-ups and briefing sessions. Need a place to meet or film?